Find tips to help protect your home in the event of a wildfire (scroll to the bottom) as well as real-life examples and advice from homeowners and experts. Discover how succulents act as a living firebreak. Succulents have become in-demand landscape plants in California because of their beauty, ease of care, and ability to withstand drought by storing moisture in their leaves. Not surprisingly, the plants are the fastest growing segment of the nursery marketplace. And now there's another, little-known reason for homeowners to grow these fleshy-leaved plants: they make a great firebreak. Camille's garden as it looks in the pages of Designing with Succulents (2nd ed). Soon after the wildfire, in a "Saved by Succulents" segment, Camille and I were on KFMB-TV News explaining how a landscape of moisture-rich plants can be firewise as well as waterwise. Ten years earlier, in Oct. 2007, the succulent garden on the cover of the first edition of Designing with Succulents "saved" a Rancho Santa Fe home, according to owner Suzy Schaefer. Neighboring houses burned to the ground. 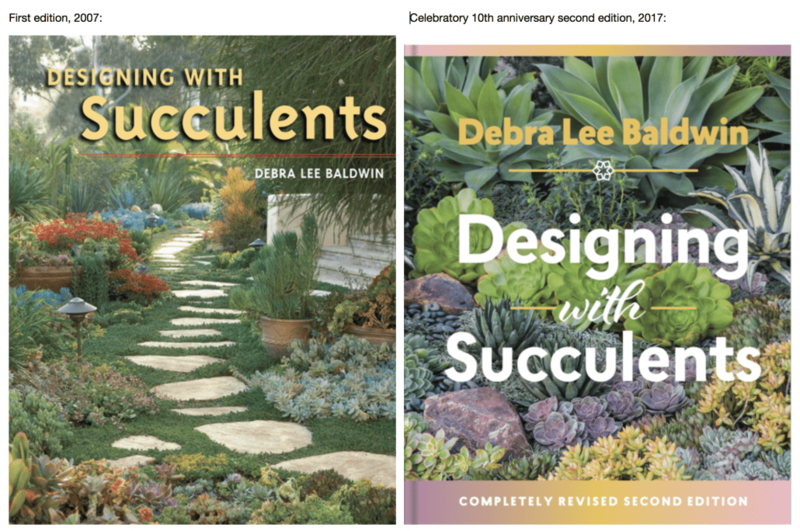 My own story of being evacuated from my San Diego home in 2007, plus “Why Succulents are Fire-Resistant,” are in the Firewise Gardening section of Designing with Succulents (2nd ed). The book helps you select the best plants for your situation and shows how to use them to create a beautiful, waterwise garden. Oct. 2007: Did Succulents Save Her Home? "Succulents saved our home!" Suzy and Rob Schaefer wrote in a jubilant e-mail to friends and family after they returned to their fire-ravaged neighborhood in Rancho Santa Fe. The tabloidian statement is out of character for the low-key couple---he's retired and she's an artist---but it seems justified. Their garden of aloes, agaves, euphorbias and more---created by Suzy with the help of San Diego landscape architect Robert Dean---encircles the Southwest-style home, which is adjacent to a palm- and eucalyptus-filled canyon. The garden is intact, but many of the canyon's trees are blackened skeletons. Shielding the most vulnerable corner of their home is an unassuming succulent that is common yet has no common name: Aloe arborescens. As it held off the flames, its fleshy leaves cooked and turned the color of putty. Aloe arborescens, native to South Africa, grows throughout Southern California; dense plantings of it rim the cliffs of coastal communities. Its tapered green leaves are serrated on the edges, but not sharp, and radiate from a central stem, forming starfish-like rosettes. These overlap into mounding plants that grow 5 or 6 feet high, and as wide. In midwinter, the plants send up brilliant orange flower spikes that, ironically, often are described as torchlike. His department, which also monitors erosion control, cautions against planting trailing ground covers such as Hottentot fig (Carpobrotus edulis) atop steep slopes; its moisture-filled leaves are heavy and roots too shallow to hold the soil. California native plants are wonderfully resilient when it comes to wildfires, but it's not because they don't burn; some of the most common natives such as the aptly named greasewood (Adenostoma fasciculatum) are highly flammable. Fire is part of the chaparral's natural cycle, enabling seeds to burst open and fresh green growth to take the place of old. This makes natives admirable---ingenious, even---but not, unless they're fleshy, fire-retardant. "There is some confusion about the terms 'drought-tolerant,' 'native plants,' and 'fire-retardant plants,'" Lyons explains. "Fire-retardant plants vis-à-vis cactus and succulents stand apart from drought tolerant and natives. A native plant garden in the chaparral is like growing Roman candles. Drought tolerant may not be much better." Remove flammable vegetation and debris. Reduce potential kindling by getting rid of weeds, dead or dying plants, and anything dry and twiggy. Make sure trees and shrubs within 100 feet of your home are well trimmed and full of moisture. If your house is on a hillside, the recommended distance is 200 feet. The ideal firewise landscape consists of low-growing shrubs, ground covers and fleshy succulents. To help retain soil moisture and minimize erosion and weeds, cover bare ground with redwood mulch or gravel. Keep plants well watered, especially during fall's desiccating Santa Ana winds. Avoid a fire ladder: fuel-rich plantings that enable fire to climb up to your home. Surround your house with a 30-foot fire break. In addition to plants that have a high moisture content, include one or more of these landscape enhancements: hardscape, a rock garden, a dry streambed and/or a swimming pool. All make excellent fire breaks. For more information, plus a list of low-fuel, firewise plants, download the California Department of Forestry and Fire Protection's publication, "Fire Safe Landscaping." Note: Some CA fire districts mistakenly recommend growing native plants to the exclusion of all others. Natives do regenerate beautifully after a wildfire but are no help slowing one down, in fact, many natives---such as creosote plant---are highly combustible. Another misconception is that it is more "green" to plant natives exclusively. This is based on the assumption that if a plant is not native, it must be invasive. Except for Carpobrotus edulis (an ice plant known as pickleweed or Hottentot fig, common to coastal areas), succulents are not invasive, and therefore pose no threat to the local ecology. • Store water in leaves or stems. • Produce very little dead or fine material. • Possess extensive, deep root systems for controlling erosion. • Maintain high moisture content with limited watering. • Grow slowly and need little maintenance. • Are low-growing in form. • Contain low levels of volatile oils or resins. • Have an open, loose branching habit with a low volume of total vegetation." In this video, I compare the combustibility of jade, aloe, aeonium, firesticks, elephant’s food and paddle cactus to branches cut from bamboo and oak trees.